There’s something to be said about this new wave of micro-games that’s been coming out of Japan, and everywhere else, lately. Short play time, simple rules, small footprint/amount of material and some deeper gameplay that could be expected, now that’s what I’m talking about. All very good stuff. AEG is mostly responsible for bring them to our shores, having re-published Love Letter and started a line of Pocket Games as a result. They’re not the only one in this party however, with Crash Games bringing us this tale of two star crossed lovers and the people who surround them, in Council of Verona. Not many games are based on the works of the Great Bard, William Shakespeare. Do they succeed on both count, bringing us a cool, fast little game that honors the play on which it is based? 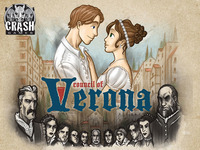 Council of Verona (Crash Games) by Michael Eskue is a small game in which you will be sending various characters, represented by cards, to the Council or to Exile, in order to set up the Agendas of characters on whom you will be placing hidden influence markers. At the end of the round, whomever has scored the most influence wins. The Poison Expansion (Crash Games) by Michael Eskue and Patrick Nickell adds another little wrinkle. Instead of placing a hidden influence token, you can now place a hidden poison or antidote on a character, in order to get rid of them at the end of the round. Like most micro games, there’s really not much in the box: 20 tokens in 5 different player colors (4 per player, with values of 0, 3, 4 or 5); 17 playing cards representing various characters that are in the play Romeo and Juliet; 2 cards denoting the Exile and the Council areas; a sheet of stickers, 5 player aids, and a small rulebook. While there isn’t much in the box, the quality of both the box and the components is top notch. The box is nice and thick and it won’t crush easily. The cards have a nice linen finish and should also stand to much abuse. The artwork is really nice and, even more importantly, the layout of the cards is very clear. While you might have to sticker the game tokens, at least there aren’t many. This is a very nice package overall. The rulebook is short enough that you can easily read it before the first game and is clear enough that, if needs be, you can quickly find any rule you might want to double check. If the base game is low in components, the expansion is even smaller: 10 tokens, a sheet of stickers and a two page “rulebook”. Again, the quality is top notch, but the color of the V stickers unfortunately doesn’t match that of the other sheet of stickers. I suggest you skip putting stickers on both sides of the tokens since it will give away your (dastardly) plans. Again, the rulebook is clear and concise. Set up couldn’t be simpler: depending on the number of players, remove or include the cards that have a small “5” in the lower left corner. Shuffle and deal one card per player. Designate a first player and that player takes all the remaining cards in his hand, selecting one and passing the rest to the player on his left. Repeat until only one card remains. This card is put away in the game box and won’t be used in this round of play. Each player then takes all of the Influence tokens in his color, except for the “4” Influence, which is only used in 2 players games. If playing with the Poison expansion, players take the Poison and the Antidote token of their player color. Place the Council card on one side of the table and the Exile card on the other side. These cards will denote whether a card is in Exile or in the Council. Play a card to either the Council area or the Exile area. This is mandatory. Use the power of the card that was played, if the card has a power. This is optional. Place an Influence token on any card that has free Influence spaces. This is optional. Once all players have played all their cards, they all get a last chance to place one more Influence token in turn order. Before I explain how scoring works, let’s look at the 17 cards that are the heart of the game. Cards have 2 different characteristics: alignment (Capulet, Montague,Neutral or Dual) and effect (Agenda or Action). The Alignment is simply what side the character is on and will make a difference when the cards are scored. Note that two of the cards have dual alignments: they are both neutral and either Capulet or Montague. The other characteristic is whether the card has an immediate effect (Action) or as an end-of-game scoring effect (Agenda). The Action cards can change the location of a card (from the Council to Exile or vice-versa), swap Influence tokens, look at Influence tokens or copy the Action of an already played card. The Agenda cards will score, only if their condition is true, whatever Influence tokens are present on them. Agenda conditions are things like: more of faction X than Y in Council or Exile, more Exiled than on Council or vice versa, or in the case of Romeo and of Juliet, being in the same location. 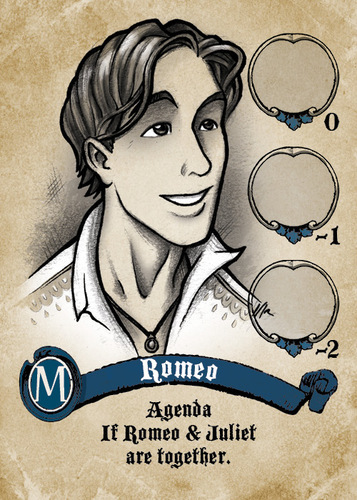 There’s even an Agenda in the 5 player version which is based on the star-crossed lovers not being in the same location. Each Agenda card has space on it for up to 3 Influence token, but some of them have a modifier, from -2 to 1. The final value of an Influence token is thus the value of the token plus the modifier of the space it’s on. So, once all the cards have been played and everyone had a chance to place one more Influence token, each card with an Agenda is evaluated to see if its condition is true. If it is, the Influence tokens that were played on the card are scored and whomever has the most point wins the round. You might want to play more than one round, with each player being the dealer once so that the game is a little longer. The Poison expansion simply adds a Poison and an Antidote token. Instead of placing a regular Influence token, the player can play, face down, either the Poison or the Antidote token. Before checking if the Agenda will score, all tokens are turned over. If there are more Poison tokens than Antidote tokens on the card, it is removed from the game. Once all cards have been checked for poisoning, score the Agenda as usual. In this way it is possible to change which card could have scored. I quite like Council of Verona: it’s a nice, fast, easy to teach filler, but that still has plenty of decision points and can be tricky to play well. The use of a semi-draft mechanic at the start of the game instead of simply dealing cards to everyone adds an element of planning, which is not always present in such small games. On the other hand, it is such a stripped down experience that if the game was any longer, it might just be overstaying its welcome. It will seriously take as much time to explain the rules the first time as it will take to play a full round. On average, a round lasts about 5 minutes, including the draft. As some others have said before, do try and get the Poison expansion if you can since it does add so much in such a small package. It’s funny how two simple token per player can change the experience, with players trying to outguess whether that new token that was added is an attempt at a character’s life or simply an attempt at scoring some Influence. Is it the game of the year? No, but it certainly one of the better micro games to have come so far. It’s really not easy to squeeze so much gaming goodness in such a small package, but Crash game has done it. This entry was posted in Review and tagged Council of Verona on November 21, 2013 by TopDog.